Wake up your face! Apply like a face wash twice a week prior to shaving. Male Species' own unique formula. Contains Hemp: rebuilds damaged cells, nourishes, increases natural moisture retention capacity; Green Tea: antioxidant protects skin from free radical damage; Aloe Vera, Witch Hazel, Cucumber, Nettle, Rosemary, Rose Hips, Grape Seed Oil, Vitamins A-C-E soothes and nourishes. Jojoba Esters provides mild exfoliation, improves circulation and balances oil production. 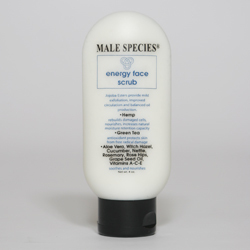 To Use: Wet face first, apply small amount of the scrub with fingertips using small circular motions. Begin at the chin and work up toward the forehead. Rinse skin thoroughly.